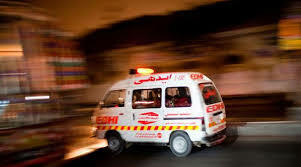 LAHORE: Armed men shot dead a youth over personal grudge and fled the scene in the provincial capital on Wednesday. Police said that the culprits Asim and Babar shot dead a youth identified as Jamil over personal grudge in Karamat Colony, Mustafa Town area of the city. The culprits fled the scene after committing the murder and the body was shifted to hospital for postmortem. The police after registering a case against the murderers have started raids for their arrest.